Ethnobotanic: The root of this plant was used by the Iroquois to treat venereal diseases, ulcers, and legs sores. The leaves were smashed and applied as a poultice to treat an abscess at the side of the neck. The plant was used to counteract sickness produced by witchcraft. The Cherokee mashed the roots of Indian tobacco and used them as a poultice for body aches. The leaves were rubbed on sores, aches, stiff necks, and chapped places. The Crow used the plant in religious ceremonies. Wildlife: Birds are attracted to the nectar, such as hummingbirds. Young seedlings provide browsing for deer and other grazing animals. General: Bellflower Family (Campanulaceae). This annual plant is up to 1 m. high with branched, hairy stems. The leaves are sessile or subsessile and toothed. They are ovate-oblong to oblong-obovate. The irregular, two-lipped flowers are blue or white, 6-8 mm. The lower lip is bearded at the base within. The flowers appear in racemes terminating the branches. The fruiting hypanthium is inflated. This plant is found in open woods or sometimes in gardens as weeds from the West Coast to Minnesota, south to Georgia and Mississippi. For current distribution, please consult the Plant Profile page for this species on the PLANTS Web site. Propagation by seeds: The seeds will germinate without cold stratification, but they need light, so sow the seeds in a flat with a damp fine grade peat lite mix. Keep the flats moist and under lights or in a greenhouse. They should green up in a few weeks. Transplant seedlings in 4-6 weeks into individual pots such as 70 cell plug trays, use the same potting mix and keep fertilizing. The seedlings are tiny at first, so fertilize them every other week with a liquid fertilizer. After another 4 weeks they can be put out in the garden or transplanted into 4 to 6 inch diameter pots Plant the seedlings in an outdoor spot that is in full sun or very light shade and never allow soil to dry out completely. Space the plants 8 to 12 inches apart. Add plenty of peat moss when planting and mulch well to keep the soil cool and moist. Protect the plants from deer. 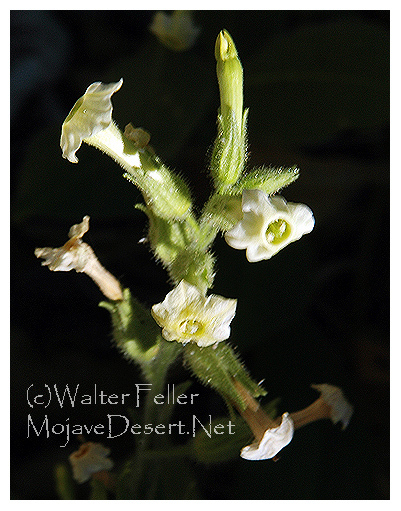 Indian tobacco will usually bloom in the first year and seeds should be allowed to self-sow. Young seedlings are heavy feeders and will require compost or fertilizer applications during the growing season. Propagation by cuttings: During early spring take two node stem cuttings (4-6 inches) before the flowers open and remove the lower leaf and half of the upper leaf. Treat the cutting with a chemical, place the cuttings in a sand and perlite medium, cover lightly, and water. Planting trays should be watered and kept moist to aid in root development. Roots will form in 2-3 weeks, but the cuttings need to force a good new crown from the lower node to successfully over-winter. Banks, W.H. 1953. Ethnobotany of the Cherokee Indians. Masters Thesis, University of Tennessee. Blankinship, J.W. 1905. Native economic plants of Montana. Montana Agricultural College Experimental Station, Bulletin 56, Bozeman, Montana. Gleason, H.A. & A. Cronquist 1991. Manual of vascular plants of Northeastern United States and adjacent Canada. Second Edition. The New York Botanical Garden, Bronx, New York. Herrick, J.W. 1995. Iroquois medical botany. Syracuse University Press, Syracuse, New York. Moerman, D.E. 1998. Native American ethnobotany. Timber Press, Portland, Oregon.